The E Eighth Avenue Local is a rapid transit service in the B Division of the New York City Subway. Its route emblem, or "bullet", is blue since it uses the IND Eighth Avenue Line in Manhattan. The E operates at all times between Jamaica Center–Parsons/Archer in Jamaica, Queens, and World Trade Center in Lower Manhattan; limited rush hour service originates and terminates at 179th Street[a] instead of Jamaica Center. Daytime service operates express in Queens[b] and local in Manhattan; late night service makes local stops along its entire route. In its early years, the E train ran along the Rutgers Street Tunnel and IND Culver Line to Brooklyn, though this service pattern stopped by the 1940s. Until 1976, it ran to Brooklyn and Queens via the IND Fulton Street Line and IND Rockaway Line. The E's northern terminal was switched from 179th Street to Jamaica Center with the opening of the IND Archer Avenue Line in 1988. The E is one of the most heavily used services in the subway system, and operates over the operating guidelines during rush hours. With the opening of the IND Queens Boulevard Line from 50th Street to Roosevelt Avenue on August 19, 1933, E service began, running between Roosevelt Avenue and Hudson Terminal (current World Trade Center station) on the IND Eighth Avenue Line. Because the IND Crosstown Line did not yet fully open, and as the IND Queens Boulevard Line had not yet opened to Jamaica, service ran via the Queens Boulevard Line's local tracks. The E also ran local in Manhattan. Initially, service ran every four minutes during rush hours and every 12 minutes overnights, with service provided by 3-car trains during rush hours and 2-car trains at other times. On January 1, 1936, the IND Sixth Avenue Line opened from West Fourth Street to East Broadway and the E was extended there. E trains no longer served stations on the Eighth Avenue Line south of West Fourth Street. On April 8 of the same year, the Sixth Avenue Line was extended through the Rutgers Street Tunnel to Jay Street–Borough Hall, and E trains were extended via this line and the IND Culver Line to Church Avenue, replacing the A train. E service was again extended with the opening of the Queens Boulevard Line extension to Kew Gardens–Union Turnpike on December 31, 1936. Express service along Queens Boulevard began on April 24, 1937, coinciding with the extension of the line and E service to 169th Street. Express service was inaugurated during rush hours, with E trains making express stops from 71st–Continental Avenues to Queens Plaza. The express service operated between approximately 6:30 and 10:30 a.m. and from 3:00 p.m. to 7:00 p.m. Express service was also provided on Saturdays between 6:30 a.m. and 4:00 p.m.. During rush hours, GG trains were extended to Continental Avenue from Queens Plaza, taking over the local. During non-rush hours local service was provided by EE trains which operated between 169th Street and Church Avenue in Brooklyn. The initial headway for express service was between three and five minutes. On September 12, 1938, nine weekday rush hour trains began terminating at Jay Street in the morning, and four entered service at Smith–Ninth Streets in the evening. The 23rd Street–Ely Avenue station opened as an in-fill station on August 28, 1939, and was served by E service during rush hours, and by EE service during other times. Between April 1939 and October 1940, select PM E trains ran to-and-from the Horace Harding Boulevard terminal at the 1939 New York World's Fair, terminating at Hudson Terminal in Manhattan. These trains ran between 8:24 p.m. and 1:30 a.m., when the fair closed for the night. Service ended following the fair. On December 15, 1940, service on the entire Sixth Avenue Line began. The E was cut back to Broadway–Lafayette Street. South of that station, it was replaced by the F train. On October 24, 1949, the E was extended during rush hours to Broadway–East New York running via Fulton Street Local to allow A trains to run express. On December 11, 1950, the Queens Boulevard Line's extension to 179th Street opened, and E trains were extended from 169th Street to terminate there. E trains ran express between Queens Plaza and 71st Avenue and local from 71st Avenue to 179th Street. In 1953, the platforms were lengthened at 75th Avenue and Sutphin Boulevard to 660 feet (200 m) to allow E and F trains to run eleven car trains. The E and F began running eleven-car trains during rush hours on September 8, 1953. The extra train car increased the total carrying capacity by 4,000 passengers. The lengthening project cost $400,000. The operation of eleven-car trains ended in 1958 because of operational difficulties. The signal blocks, especially in Manhattan, were too short to accommodate the longer trains, and the motormen had a very small margin of error to properly platform the train. It was found that operating ten-car trains allowed for two additional trains per hour to be scheduled. Then, on October 30, 1954, E trains began running to Hudson Terminal during non-rush hours, and began running express in Manhattan during rush hours. On June 28, 1956, the LIRR Rockaway Beach Branch re-opened as the IND Rockaway Line after being converted for subway service and E service was extended from East New York to Rockaway Park or Wavecrest during weekday rush hours. During non-rush hours, service was provided by shuttle service between Euclid and Rockaway Park or Wavecrest. On September 8, 1959, the E began running express to Euclid Avenue, while the A became local; however, in 1960, the E train became an express in Brooklyn and was extended to the Rockaways, with some put-ins beginning at Euclid Avenue and later Lefferts Boulevard during rush hours. Some E trains were extended to Lefferts Boulevard on June 6 of that year due to complaints. In 1963–1964, the E was extended to the Rockaways during rush hours, with some put-ins beginning at Euclid Avenue and later Lefferts Boulevard. On March 23, 1970, southbound E trains, during rush hours, began stopping at the lower level of the 42nd Street station. On January 2, 1973, the E train became the local in Brooklyn again, running to Rockaway Park–Beach 116th Street only. Finally, on August 27, 1976, E service in Brooklyn was eliminated with all trains terminating at World Trade Center (the local platform). Brooklyn service was replaced by the CC local. The 1988 changes angered some riders because they resulted in the loss of direct Queens Boulevard Express service at local stations east of 71st Avenue (169th Street, Sutphin Boulevard, Van Wyck Boulevard and 75th Avenue stations). Local elected officials pressured the MTA to eliminate all-local service at these stations. As part of service cuts on September 30, 1990, the R was cut back to 71st–Continental Avenue outside of rush hours. Local service to 179th Street was replaced by F trains, which provided Queens Boulevard Express service, during middays, evenings, and weekends, and local G service during late nights. In 1992, the MTA considered three options to improve service at these local stops, including leaving service as is, having E trains run local east of 71st Avenue along with R service, and having F trains run local east of 71st Avenue replacing R service, which would be cut back to 71st Avenue at all times. The third option was chosen to be tested for six months starting in October or November 1992. The test started on October 26, 1992 and was implemented on a permanent basis six months later, eliminating express service along Hillside Avenue. On March 23, 1997, the E service began stopping at 75th Avenue and Van Wyck Boulevard during evenings, nights and weekends. On August 30, 1997, E service began running local in Queens during late nights. On the same date, late night G service was permanently cut back from 179th Street to Court Square, replaced by F service running local east of Queens Plaza, doubling late night service frequency at Queens Boulevard local stations. During the early part of 2000, because of the replacement of track switches at the World Trade Center station, the E was extended to Euclid Avenue at all times except late nights, when it operated to Canal Street. Service on the E was again affected by the September 11 attacks in 2001, as its terminal station, World Trade Center, was located at the northeastern corner of the World Trade Center site, so for a time, the E again operated to Euclid Avenue in Brooklyn as the local on the IND Fulton Street Line at all times except late nights, replacing the temporarily suspended C service. On September 24, 2001, C service was restored, and E service was cut back to Canal Street, since World Trade Center would be closed until January 28, 2002. 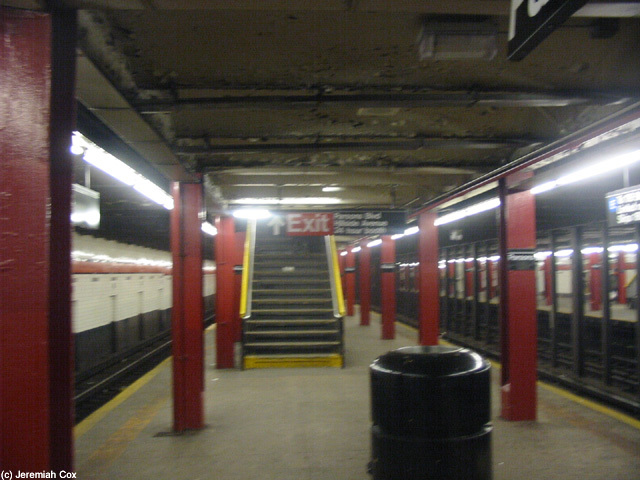 On December 16, 2001, the connection from the IND 63rd Street Line to the Queens Boulevard Line opened, and F trains were rerouted via this connector to travel between Manhattan and Queens. E service was increased from 12 trains per hour to 15 trains per hour to make up some of the loss of Queens Boulevard Express service running along 53rd Street. These three additional rush hour E trains ran to 179th Street in the PM rush hour, instead of to Jamaica Center, due to its lack of capacity. F service decreased from 18 trains per hour to 15 trains per hour to accommodate these trains. The EE originally ran as an Eighth Avenue local between 71st–Continental Avenues and Chambers Street during off peak hours when the GG didn't run. This service was discontinued when the IND Sixth Avenue Line opened on December 15, 1940. However, the EE reappeared on November 26, 1967 when it ran between 71st–Continental Avenues and Whitehall Street via the local tracks of the BMT Broadway Line, replacing the QT and RR. This service was discontinued on August 30, 1976, and replaced by the N. The route of the EE to Whitehall Street is currently duplicated by the R service. Four E trips originate from 179th Street during the a.m. rush hour, three E trips originate from 179th Street during the p.m. rush hour, and four trips terminate at 179th Street during the p.m. rush hour. ^ Limited rush hour service to Manhattan originates at 179th Street during a.m. and p.m. rush hours; service from Manhattan terminates at 179th Street during p.m. rush hours only. Signs are located above the express tracks at Kew Gardens–Union Turnpike and Parsons Boulevard, showing that trains skip 169th Street. Part of one of these signs can be seen in this 2004 photo at Parsons Boulevard Archived September 27, 2007, at the Wayback Machine. ^ During weekday rush hours and middays, E trains skip 75th Avenue and Briarwood; at all other times, E trains serve these two stops. ^ Chambers Street–World Trade Center are actually counted as two separate stations by the MTA. The E train terminates at World Trade Center while the A and ​C trains have through service at Chambers Street. ^ a b "E Subway Timetable, Effective November 4, 2018" (PDF). Metropolitan Transportation Authority. Retrieved February 28, 2019. ^ a b c d e f g h i j k l m n Bolden, Eric. "NYCT Line by Line History". www.erictb.info. Retrieved June 17, 2016. ^ "New Subway Links Running Smoothly; Exact Schedules Maintained on First Day's Operation of Queens Tubes". The New York Times. August 20, 1933. ISSN 0362-4331. Retrieved June 20, 2016. ^ "Two Subway Units Open at Midnight; Links in City-Owned System in Queens and Brooklyn to Have 15 Stations. Trains Tested on Routes Full Staffs Operate Them on Schedule Minus Passengers -- Celebrations Planned". The New York Times. August 18, 1933. ISSN 0362-4331. Retrieved June 20, 2016. ^ a b Oszustowicz, Eric (March 2006). "A History of the R-1 to R-9 Passenger Car Fleet" (PDF). The Bulletin. Electric Railroaders' Association. 49 (3). ^ "La Guardia Opens New Subway Link; Warmly Praises Delaney as He Puts $17,300,000 Line on East Side Into Service. Seeks Wider Home Rule Hints at Ceremony That City Will Again Attempt to End Transit Board's Powers. The Mayor Opens a New Line of the City Subway System. La Guardia Opens New Subway Link". The New York Times. January 2, 1936. ISSN 0362-4331. Retrieved June 20, 2016. ^ "Two Subway Links Start Wednesday; City Will Begin Operating Fulton Street Line and Extension to Jay Street. Mayor to Make Trip Entire System With Exception of Sixth Av. Route to Be Finished Early Next Year". The New York Times. April 6, 1936. ISSN 0362-4331. Retrieved June 20, 2016. ^ "Trains Testing Jamaica Link Of City Subway". The Brooklyn Daily Eagle. April 10, 1937. p. 3. Retrieved April 24, 2018. ^ "Jamaica Will Greet Subway". The New York Sun. April 23, 1937. p. 8. Retrieved April 24, 2018. ^ a b "New Subway Link to Jamaica Opened; La Guardia, City Officials and Civic Groups Make Trial Run on 10-Car Train". The New York Times. April 25, 1937. ISSN 0362-4331. Retrieved June 20, 2016. ^ "Transit Link Open Today; 8th Ave. Line Extended to Jamaica—Celebration Arranged". The New York Times. April 24, 1937. ISSN 0362-4331. Retrieved August 4, 2016. ^ * "Subway Station Opens Aug. 28" (PDF). The New York Times. August 5, 1939. Retrieved October 4, 2015. "Ely Subway Stop To Open; Queens Station on City-Owned Line Begins Service Tomorrow" (PDF). The New York Times. August 26, 1939. Retrieved October 4, 2015. ^ "How to Get To The Fair Grounds; by Subway". The New York Times. April 30, 1939. Retrieved July 7, 2015. ^ "New Subway Spur Is Ready to Open: First Train to Start Four Minutes Before the Fair Officially Begins". The New York Times. April 17, 1939. Retrieved July 7, 2015. ^ "New Subway Link Opening in Queens" (PDF). The New York Times. December 12, 1950. Retrieved June 30, 2015. ^ "Subway Link Opens Monday" (PDF). The New York Times. December 6, 1950. Retrieved June 30, 2015. ^ "Bronx to Coney Ride In New Subway Link" (PDF). The New York Times. October 18, 1954. Retrieved February 20, 2016. ^ ERA Headlights. Electric Railroaders Association. 1956. ^ "Some "E" Trains Were Extended To Lefferts Boulevard". The New York Division Bulletin. Electric Railroaders' Association. 3 (2): 1. June 1960 – via Issu. ^ a b Fischler, Stan; Friedman, Richard (May 23, 1976). "Subways" (PDF). The New York Times. Retrieved July 7, 2015. ^ a b "Service Adjustment on BMT and IND Lines Effective 1 A.M. Monday, Aug. 30". Flickr. New York City Transit Authority. August 1976. Retrieved October 23, 2016. ^ Donohue, Pete (January 21, 2000). "C you later, riders told Track work will shut Eighth Ave. line". New York Daily News. Retrieved January 8, 2019. ^ "WTC subway stop on E train line reopens". The Journal News. White Plains, New York. January 29, 2002. Retrieved March 8, 2019. ^ Danzig, Allison (September 7, 1939). "International Array of Stars Ready for Opening of U.S. Title Tennis Today; Four Australians Stay for Tourney Quist, Bromwich, Hopman and Crawford Get Permission to Play at Forest Hills Riggs Among Favorites Hopes to Avenge Setback in Davis Cup Event--British Women to Seek Honors". The New York Times. Retrieved July 7, 2015. ^ Perlmutter, Emanuel (November 16, 1967). "Subway Changes To Speed Service: Major Alterations in Maps, Routes and Signs Will Take Effect Nov. 26" (PDF). The New York Times. Retrieved July 7, 2015. ^ Burks, Edward C. (August 14, 1976). "215 More Daily Subway Runs Will Be Eliminated by Aug. 30". The New York Times. Retrieved July 7, 2015. ^ "E train southbound". Trip Planner+. Retrieved October 30, 2016. ^ "E train northbound". Trip Planner+. Retrieved October 30, 2016. Wikimedia Commons has media related to E (New York City Subway service). "E Subway Timetable, Effective June 24, 2018" (PDF). Metropolitan Transportation Authority. Retrieved June 24, 2018.